Nov 11, 2016 — by Ernest Robertson D.D.S. There are many dental problems that can result in tooth damage and tooth loss. Gum disease and cavities are perhaps the most common and well-known oral health problems. But did you know that chronic teeth grinding, a condition known as bruxism, can also seriously damage the teeth? At Harlem Center for Aesthetic Dentistry, Dr. Ernest Robertson can check for symptoms of bruxism, and offer restorative and general dentistry treatment to repair dental damage if we find that you habitually grind and clench your teeth. To learn more about chronic teeth grinding and dental damage, contact our Brooklyn, NY practice today. Stress or anxiety: Studies have found that stress is the cause of the majority of cases of bruxism. This often affects patients on a subconscious level, resulting in clenching and grinding during sleep. Medication: Certain medications, particularly selective serotonin reuptake inhibitors (SSRI), may cause bruxism. Alcohol and caffeine: The excessive consumption of alcohol and caffeine can cause bruxism. Smoking: Patients that smoke cigarettes are ore likely to grind and clench their teeth. Recreational drugs: Certain recreational drugs, such as cocaine and ecstasy, can cause teeth grinding and clenching. Tooth fractures: When excessive pressure is placed on the teeth, they may crack or fracture. Tooth fractures can increase the risk of dental decay and root canal infection because the cracks in the teeth leave the interior structures vulnerable to dental bacteria. 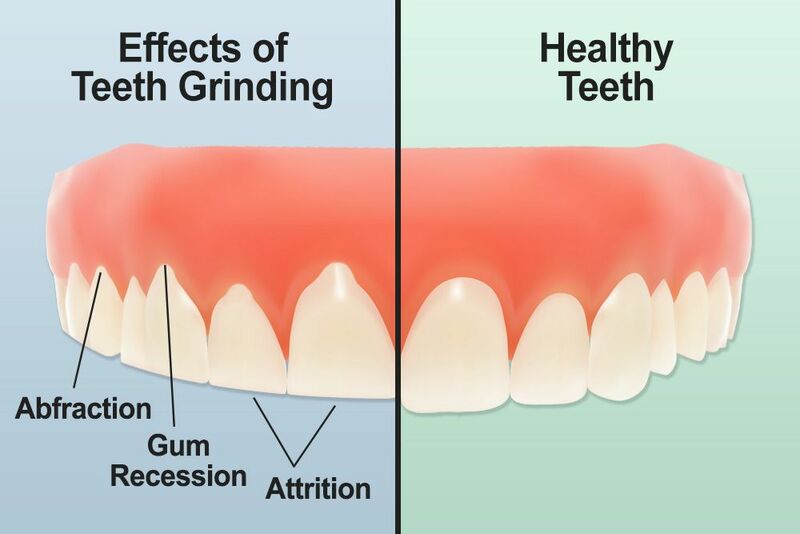 Tooth erosion: Tooth erosion and wear occurs as a result of habitual grinding. As the enamel wears, the tooth may appear discolored or become more sensitive. In addition, patients may wear down the biting surface of a tooth, resulting in the need for a dental restoration. Gum recession: The excess pressure caused by teeth grinding also cause the gums to recede. This makes the tooth more vulnerable to root cavities and tooth sensitivity. Tooth sensitivity: As the tooth enamel and gums wear, the nerves become exposed. This makes the teeth more sensitive to hot and cold temperatures. Damaged fillings and crown: In addition to fracturing your teeth, teeth grinding can crack or wear down your dental restorations. This leads to the need for early replacement. Treating the underlying cause of bruxism, such as stress, can be difficult. At Harlem Center for Aesthetic Dentistry, we seek to prevent that dental damage that occurs as a result of bruxism by providing patients with a custom mouth guard. A mouth guard can be worn at night to prevent you from clenching your jaw or grinding your teeth while you sleep. To find out if a custom mouth guard can prevent dental damage that results from bruxism, contact Harlem Center for Aesthetic Dentistry today.